I love these report back threads, so I thought that it would be worthwhile starting a thread on my personal favorite section of yellowfish water. The Lower orange, refers to the section of the Orange River, downstream of the Vaal Orange confluence, all the way down to the mouth at Alexander bay. It includes the Richtersveld region, which it typically recognised to be the area from Vioolsdrift to Alex. This streatch has become quite a destination in recent years, and is the area I am most interested in. Last edited by Fisher; 01-08-08 at 12:21 PM. There is not a single bad person on earth, only persons that have been badly influenced. If you would like to be better person, remove the things that have a negative influence on you TODAY. The Orange River from Douglas past Upington and into the Richtersveld is something spectacular. 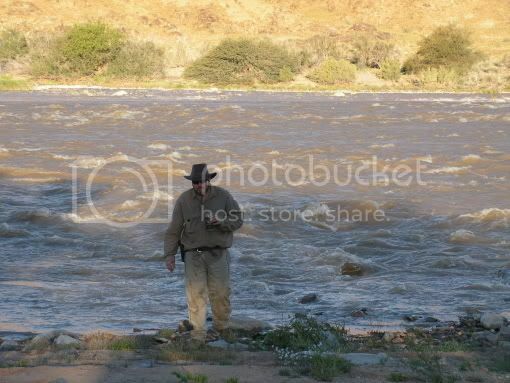 I have fished a few sections of this Magnificent River, but I have never been to the Richtersveld. Every year I promise myself that this is going to be the year, but I just dont get to it, but come Hell or High Water I am fishing The Richtersveld next year. Most of the places along the banks of the Orange looks like the surface of the Moon, especially in the Richtersveld, Upington(Augrabies falls), Boegoebergdam, Niekerkshoop,etc. 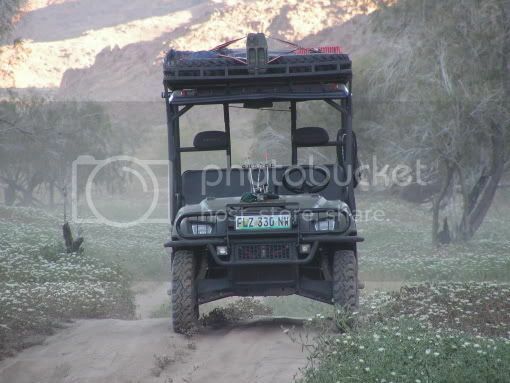 The Richtersveld is definately on my Bucket List! Great I'm there 28 Sept to 4 Oct 2008. Will report back but will hopefully get some info from here before we go. After arriving home at about 10 last night, after driving all day, the report back is finally ready. here it is. Kevin and I left my place in tokai at about 23h00 on Tuesday night and set off to Blouberg where we collected Kyle and all his gear. We made our way up the N7, all the way to the Vioolsdrift border, where we crossed at about 07h00 on Wednesday morning. We proceeded to follow the Orange River from Vioolsdrift towards Rosh Pinah. The river was low and clear, flowing at less than 20 cumecs, and we were able to observe and mark several likely spots where fishing would potentially be good. We settled at a spot where the river ran close to the road, about 100km's from Vioolsdrift. We tackled up, and excitedly made our way into a wide shallow rapid. All three of us emplyed standard 3 fly CZN rigs, and were into fish within a few casts. It became clear to us that out 7 and 9 pound leaders were hopelessly inadequate, as the fish that didn't break us off, were simply impossible to hold on to. We got well and truly smoked, and the few fish we did land, did not justify the number of flies we lost, and the leaders we had to replace. Anyway, we returnrd to the vehicle after a couple of hours and slowly made our way along the river to the pont at Sendelings Drift where we crossed back into SA. After checking into the Richterveld National park, we joined the rest of the 11 man group, and drove the few km's to our camping site at Pooitjiespram. 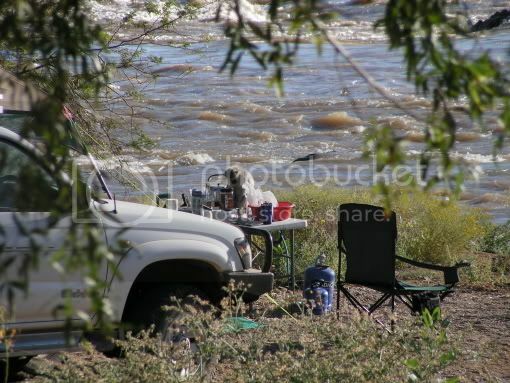 By that time it was about 17h00, and most of the guys set up their tents and opted for a few bevvies after a long day driving, instead of fishing. Kevin C of course went fishing, and was successfull in a fast rapid. Thursday morning saw us all up bright and early, and after a huge bacon and egg camp brekkie, made our way about a km downstream to a section of the river called "Jennie se gat" (dont' ask) where the fish were to be found aggressively feeding in shallow riffle water. The fish came out thick and fast with myself and Kevin taking about 30 fish each for the morning. Healthy numbers were also taken by everyone else in the group. There were hundreds of swalllows feeding on a hatch, which lasted all day. It is quite something to be able to fish in the midst of hoards of diving swallows. Friday morning, up early, cornflakes and coffee for brekkie, pack up camp, and head off towards De Hoop camp site. The road from Pooitjies to De Hoop, goes through three passes, and although is only 45 km's, takes a good three hours of serious macho 4x4ing, with Akkedis pass, providing the less experienced off roader with a few interesting challenges. The "halfmens" pass, gets it name from the unusual halfmens plant, where 90 percent of the entire population of these plants are to be found. The Penkop pass, goes past the Penkop mountain and traverses a dry river bed with a series of narrow rocky passages. It is here where driving gets a little technical, as tyre damage is a real threat. Anyway, back to the fishing. We arrived at De Hoop at around mid day, and proceeded directly for the water rod in hand, and found the fish immediately. The rest of the day is a blur of bent rods, gold bars, and screaming reels. Saturday was a day to remember, and certainly one of the most rewarding I have ever had in all my 15 or so trips to this region. Kevin and I did a drift down the river a few km's and although the fishing slowed down during mid day, we were rewarded with a largie and a few smallies. The potential for drifting still needs to be completely explored however. I will let Kevin explain what happenned that evening, but all in all, De hoop also yielded a good 50 fish each to Kevin and myself, with the less experienced guys struggling to find the depth and the technique in conditions that proved to be technical and difficult, with the takes as soft and gentle as I can ever remember yellowfish to be anywhere. The less experienced guys, simply could not detect the subtle takes. Sunday, was an eary start with a pack up, and the drive back to cape Town. As usual John Yelland from Upstream, put a superb excursion together, and two young guys Eddie and Ruann comming all the way from Pretoria, especially to join us for this one. Total tally fo fish for the group was about 500 fish with myself anf Kevin bagging a persomal tally of around 200 each. Most inte 3 to 4 pound range, with a few in the 5 pound range, and one or two of 6 pounds. A few largies and a few muddies as well. Thank's very much for such a wonderfull report. Nou juk my gat SERIOOOOOS. Are we not blessed ???? and cursed There are so many waters I have to fish but the years and finances don't allow. That is one trip that is on my to do list afore I die. Hope you can accommodate feeble old men in 20 years time. It's not in the catching, it's in the learning something new. Lekker report back, the water looks awesome and the trip sounds like the stuff long lasting memories are made of. Hope you guys bathed the fish in salt after being handled by Toxic Cox. Thanks for the great report Andre. Awesome fishing guys, well done! Kevin told me about the monster that he lost when his dropper got hung on, eish, what a pity! Better luck next time Kev! Yup, several fish were lost simply due to under gunning. There is definaly scope for a 7 or 8wt outfit with a 15 to 20 pound rig. I have never before hooked into so many big fish and lost them. The standard CZN setup with 5wt and 7 to 9 pound leader was hopelessly insufficient. It is heartbreaking to see a huge yellow, simply smoke you, with precious little to answer back with.